THIS ITEM IS NOT AVAILABLE AT PRESENT. WE WILL NOT BE GETTING ANYMORE My Little Pony Friendship is Magic Rainbow Dash 24 Ounce Plastic Mason Jar. From the My Little Pony collection by Silver Buffalo. 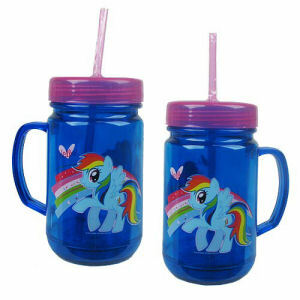 My Little Pony Friendship is Magic Rainbow Dash 24 Ounce Plastic Mason Jar. This Mason Jar has a handle and twist off lid. Includes reusable straw. Hand wash only. Not dishwasher safe. Do not microwave. Silver Buffalo My Little Pony Water Bottles shipping from Canada. No Surprise Border fees or Customs!